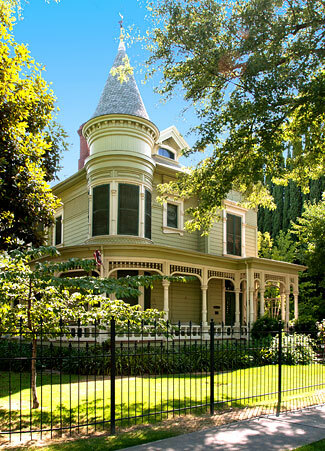 The Kaehler-Rector House is one of the finest remaining examples of Victorian Queen Anne architecture in Merced County. Designed by Louis Wegner, a locally known architect and builder, the home was lavishly constructed in terms of size and appointments, both inside and out. It is popularly referred to as one of the old castles of Merced and is one of the better restored of this group. Louis Wegner, a native of Germany, was a well-known architect in the Merced area and a builder with the instincts of a craftsman. He was active in local affairs, serving twice as Mayor of Merced. He focused much of his energy on city beautification, improving streets and installing sidewalks. Many of the finest buildings in the town and county are products of his combined talents as architect and builder. George Kaehler, the original owner, was a prominent businessman. Kaehler and his brothers, Reinhold and Max, were in the wholesale liquor business in Merced, Fresno, and Los Banos. Judge E. N. Rector, the second owner, served on the Superior Court of Merced County for thirty-eight years. His father had been instrumental in the formation of Merced County, leading the drive to separate it from Mariposa County in 1855. Rector occupied the home from 1903 until his death in 1941.